In order to achieve an authentic result in the sound as well as in the restorative quality, extensive research about the object in question was essential. And what could be more obvious than to return to the origins of our organ. Sonja Fußmann and Oliver Schulte went on a one week long research excursion, which ranked as one of the biggest moments in the project and made lasting impressions on all involved. Thank you to Harrison&Harrison, England's largest organ building company and a traditionally rich business. The warmheartedness and openness that Mark Venning greeted us with, the manager of H&H and former ISO President, as well as the valuable suggestions and stoplists he gave to us, both impressed and delighted us! 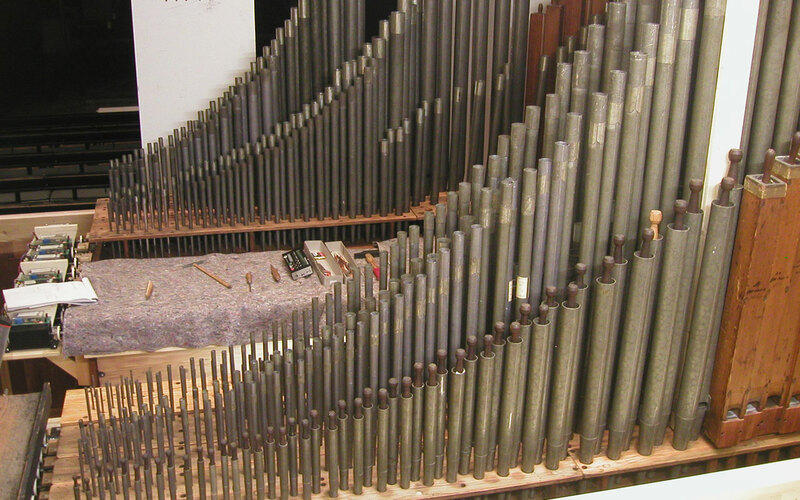 A further thank you goes to David Wood, the organ builder at Huddersfield, who not only facilitated access to quite a number of instruments (the Binns organ at Marsden and the massive Father-Willis organ from Town-Hall at Huddersfield, among others), but also imparted free insight into the original archives of the J.J. Binns company - for us exciting and enlightening moments! Furthermore, David Wood organised an original Binns oboe for the swell organ of the Limpericher organ and provided us with comfortable lodgings including a great breakfast! Saying good-bye was hearty in the hopes of being able to return the favour at some point in time – even if it is only with a “continental” breakfast! A few impressions of the trip may be viewed in the picture gallery..